Thymoquinone (TQ), or 2-isopropyl-5-methyl-1,4-benzoquinone [Figure 1]A, is the main active constituent of the volatile oil of Nigella sativa seeds ,. Thymoquinone has various pharmacological properties such as analgesic, anti-inflammatory, antibacterial, anti-diabetic, and anti-cancer effects . In addition, TQ supplementation can noticeably protect different organs against the oxidative damage induced by some oxidising agents including sodium nitrate  and aflatoxin B1 . Organophosphorus compounds (OPCs) are commonly used as effective insecticides in agricultural pest control. In addition to the irreversible inhibition of acetylcholinesterase (AChE) activity in the synaptic terminals of the nervous system, the occurrence of oxidative stress (OS) has been reported as the chief mechanism of OPCs toxicity ,,. Previous studies have confirmed the hepatotoxic effects of OPCs in different animal models ,,. For instance, Kalender et al. showed that OPCs can increase the levels of the liver enzymes such as alanine transaminase (ALT) and aspartate transaminase (AST) as well as histopathological changes of hepatic tissue in the rat . In addition, Mostafalou et al. found that OPCs exert several toxic effects on liver function through oxidative damage and inflammatory reactions . Oxidative stress is the result of an imbalance between antioxidant agents and free radicals involved in cellular damage . Diazinon (DZN), or O,O - diethyl O- [4 - methyl - 6 - (propan - 2 - yl) pyrimidin- 2 - yl] phosphorothioate [Figure 1]B, is one of the most widely used OPCs pesticides in the agriculture and public health . This organophosphate insecticide affects mitochondrial membrane transport in the hepatocytes, and it is associated with the occurrence of OS and risk of liver failure in animals and human ,. Based on existing evidence, the present study was designed to evaluate the effects of TQ on the oxidative damage induced by DZN in the liver tissue of mice. All chemicals were obtained from Merck (Darmstate, Germany) unless otherwise stated. Thymoquinone (98% purity, CAS#: 490-91-5), 5,5′-Dithiobis (2-nitrobenzoic acid) (DTNB), dimethyl sulfoxide (DMSO) (99% purity, CAS#: 67-68-5), N-(1-naphthyl) ethylenediamine dihydrochloride (NED), 2-thiobarbituric acid (TBA), and 2, 4, 6-tris (2-pyridyl)-s-triazine (TPTZ) were purchased from Sigma-Aldrich Chemical Company (St. Louis, MO, USA). Diazinon (99% purity, CAS#: 333-41-5) was a gift from the Shimi-Keshavarz Pesticide Production Co., Tehran, I.R. Iran. Male albino mice (25-30 g) were purchased from animal house of Hamadan University of Medical Science (HUMS), Hamadan, I.R. Iran and quarantined for one week prior to use. The animals were kept under suitable laboratory conditions (12 h light/dark cycles and temperature of 22-25 °C) and fed with standard diet and water ad libitum. The study protocol was approved by Ethics Committee of Hamadan University of Medical Sciences (HUMS) with ethical ID 940201445. The TQ effects were evaluated on butyrylcholinesterase (BChE) and hepatic enzymes in the range of 1.25-10 mg/kg basis of pilot studies. Following one week treatment, the TQ up to 5 mg/kg produced no sign of toxicity in the animals [Table 1]. Table 1: The effects of thymoquinone on serum enzyme biomarkers. The mice were divided into five groups of 6 each and treated for one week by intraperitoneal (i.p.) injection as follows: group 1 received DMSO (10%) as a vehicle. Group 2 received 16 mg/kg of DZN. Group 3 received 5 mg/kg of TQ, and groups 4 and 5 were administrated DZN (16 mg/kg) following treatment with 1.25 and 5 mg/kg of TQ, respectively. The injection volume was 0.2 mL for each animal. At the end of study course, the mice were weighed and then anaesthetized with ketamine at 50 mg/kg and xylazine 10 mg/kg . Blood samples were collected by cardiac puncture, and serum separated for biochemical experiments. After isolation of liver, a portion of this tissue was homogenized in phosphate-buffered saline (PBS, pH 7.4). The liver homogenate (10%, w/v) were centrifuged at 3000 g for 10 min at 4 °C. Then, the supernatants were separated and kept at -80 °C until the biochemical analysis. In addition, the other portion of liver was fixed in 10% buffered formalin for histopathological examination. The serum BChE activity was determined by calculating the rise in yellow color due to the production of thiocholine when it reacts with DTNB as described by modified Ellman's spectrophotometric method according to Ozarowski et al. . Serum ALT, AST, and alkaline phosphatase (ALP) activity were determined by enzymatic colorimetric kits (Pars Azmun kit, Iran). Liver nitric oxide (NO) was assessed using Griess reagent (1% sulfanilamide, 0.1% NED, and 2.5% phosphoric acid) . In addition, total antioxidant capacity (TAC) and lipid peroxidation (LPO) in liver were determined by ferric reducing ability of plasma and thiobarbituric acid reactive substances methods, respectively; as described in the previous study . Total thiol molecule (TTM) was assessed using DTNB as the reagent . At the end of each experiment, protein content was determined in the crude homogenate of liver according to Bradford method using bovine serum albumin (BSA) as a standard. After dissection, about half of the liver was detached from the mice and was held in 10% formalin for at least 24 h to be maximally fixed. The organ was sampled into a portion with 2 to 3 mm thickness; embedded in a plastic capsule. The paraffin-embedded block was prepared by automatic tissue processor, Autotechnique. Then, the tissue was cut into 4 μm thick sections by a rotating microtome with at least 3 cross-section of tissue on each slide. They were stained with hematoxylin and eosin (H&E) dye and were examined for histopathological changes ,. The data are expressed as the mean ± standard deviation (SD) and analyzed by Graph Pad Prism software, version 6.0. The statistical difference of the values was determined by one-way analysis of variance (ANOVA) with Tukey's test for multiple comparisons. A P-value of less than 0.05 was considered statistically significant. Our findings revealed that TQ up to 5 mg/kg produced no sign of toxicity [Table 1]. As shown in [Figure 2]A, a significant decrease in BChE activity was observed in DZN and treatment groups compared to control group (P < 0.001). In addition, the administration of DZN could significantly increase ALT (P < 0.01), AST (P < 0.001), and ALP (P < 0.001) serum activity in comparison with the control [Figure 2]B, [Figure 2]C, [Figure 2]D, respectively). Figure 2: Effects of thymoquinone (TQ) on serum enzymes A, BChE (butyrylcholinesterase); B, ALT (alanine aminotransferase); C, AST (aspartate aminotransferase); D, ALP (alkaline phosphatase) in diazinon (DZN)-exposed mice. Statistical analysis used one-way ANOVA with Tukey's test. Values are expressed as means ± SD, n = 6 for each group. ##P < 0.01, ###P < 0.001 vs control group; *P < 0.05, ** P< 0.01 vs DZN group. Thymoquinone administration could improve the serum levels of aminotransferase enzymes (ALT, AST, and ALP) in animals exposed to DZN. Following D Following DZN administration, the levels of LPO [Figure 3]A and NO [Figure 3]B were increased (P < 0.001) and TAC [Figure 3]C, as well as TTM [Figure 3]D levels, were decreased in liver tissue compared to control group (P < 0.05 and P < 0.001; respectively). In this study, a remarkable decrease was observed in LPO and NO levels after treatment with different doses of TQ compared to DZN group. In addition, a significant improvement was observed in TAC and TTM levels, after administering a low dose of TQ (P < 0.05). Figure 3: Effects of thymoquinone (TQ) on oxidative stress biomarkers. A, LPO (lipid peroxidation); B, NO (nitric oxide); C, TAC (total antioxidant capacity); D, TTM (total thiol molecule) in diazinon (DZN)-exposed mice. Statistical analysis used one-way ANOVA with Tukey's test. Values are expressed as means ± SD, n = 6 for each group. #P < 0.05, ###P < 0.001 vs control group; *P < 0.05, **P < 0.01 ***P < 0.001 vs DZN group. The histopathological examinations showed some pathological changes in liver tissue, including necrosis, inflammation, hyperplasia of kupffer cells, disruption of hepatocytes, sinusoidal dilatation, and infiltration of mononuclear cells, in DZN group. Thymoquinone prevented some of the histopathological changes of DZN such as necrosis and decreased disruption of hepatocytes in liver tissue [Figure 4], [Table 2]. Figure 4: Photomicrographs of mice liver tissue in different groups: A, negative control group; B, diazinon (DZN) (16 mg/kg); C, thymoquinone (TQ) (5 mg/kg); D, DZN (16 mg/kg) + TQ (1.25 mg/kg); E, DZN (16 mg/kg) + TQ (5 mg/kg). Original magnification of all images is × 40. Cv, central vein; HP, hepatocyte; Kup, kupffer cells; Nec, necrosis; Lym, lymphocyte; Sn, sinusoid. Table 2: Histopathological changes of liver in experimental groups. Our findings showed that DZN at 16 mg/kg induced liver injury in male mice and low doses of TQ prevented its hepatotoxic effects. The BChE enzyme, as a specific biomarker in OPC poisoning ,, was significantly decreased in animals received DZN. However, there was no significant difference in the serum BChE enzyme activity between TQ-treated groups and DZN positive control group. This clearly shows that TQ may not have an affinity for the BChE enzyme. The hepatic enzymes of serum ALT, AST, and ALP are well known as biomarkers for early acute hepatic injury . The levels of these enzymes were significantly increased in the DZN group alongside the pathologic changes. The raised levels of the ALT and AST enzymes in the serum indicated cellular leakage and loss of functional integrity of the liver cell membrane . In addition, elevated contents of ALP may reflect impaired biliary tract function . The level of serum ALP might be raised due to the presence of increased biliary pressure and cholestasis ,. Several studies have reported the hepatotoxicity of OPC in various animal models ,,. Because the toxicity of OPC, similar to that of other oxidant agents, is associated with OS , LPO, and NO (as oxidant biomarkers), TAC and TTM (as antioxidant indices), these markers were measured in this study. Our findings showed that LPO and NO increased and the TAC and TTM decreased in the liver tissue of DZN group, indicating the induction of OS due to DZN toxicity. In many studies, oxidative damage induced by various OPCs such as DZN  and malathion  has been reported. Mitochondrial dysfunction , excessive acetylcholine accumulation and the alteration of antioxidative enzymes such as superoxide dismutase and catalase  and thiol molecules depletion, such as glutathione  are the most important mechanisms for oxidative liver damage due to OPC toxicity. In addition, it is known that NO reacts with high affinity with superoxide anion, thereby producing the highly toxic and pro-apoptotic peroxynitrite that triggers inflammatory processes and contributes directly to oxidative damages . In previous studies, the protective effects of TQ have been confirmed in other models of liver toxicity due to various agents such as acetaminophen , antituberculosis drugs  and carbon tetrachloride . In the present study, the hepatoprotective effects of TQ were in accordance with our previous findings that TQ inhibits aflatoxin B1-induced hepatotoxicity through the suppression of lipid peroxidation and the prevention of the depletion of intracellular antioxidants . Thymoquinone is a structural analogue to o-benzoquinones and is able to inhibit the covalent binding of free radical products to intracellular macromolecules such as lipids . In addition, the administration of TQ effectively induces increases in glutathione transferase and quinone reductase activity, even in the absence of toxic agents . Therefore, these two mechanisms can enhance the intracellular antioxidant system following administration of a low dose of TQ. In previous study, the median lethal dose (LD50) of TQ (in olive oil, as a vehicle) was determined to be 104.7 mg/kg (89.7-119.7 mg/kg, 95% confidence interval) in mice after i.p. injection . Despite of TQ safe dose which were used in this study, the therapeutic effects of low dose TQ were relatively better than high doses of this substance. The difference in vehicles for TQ may be one of the causative agents for the changes in TQ efficiency. In some studies, polar solvents, such as normal saline and phosphate buffer, have been used as a vehicle for TQ ,, while in this study, 10% DMSO was used to dissolve the TQ. This difference in solvents seems to be the major cause of the difference in the optimum doses in the different studies. Dimethyl sulfoxide, a penetration enhancer with less toxicity (LD50 = 4-9 g/kg), has a high penetrance into cell membranes and is usually used as a vehicle for local drug delivery . Dimethyl sulfoxide may facilitate the transport of TQ into cells, increasing the TQ potency on one hand and decreasing the therapeutic window on the other hand. This study showed that TQ can prevent hepatic DZN toxicity by improving the tissue antioxidant state. Our findings may offer a new approach for clinical trials using TQ as an adjuvant in organophosphate poisoning management. This work was financially supported (Grant No. 940201445) by the Vice-chancellor of Research and Technology, Hamadan University of Medical Sciences, Hamadan, I.R. Iran. Bargi R, Asgharzadeh F, Beheshti F, Hosseini M, Farzadnia M, Khazaei M. Thymoquinone protects the rat kidneys against renal fibrosis. Res Pharm Sci. 2017;12(6):479-487. Nili-Ahmadabadi A, Tavakoli F, Hasanzadeh G, Rahimi H, Sabzevari O. Protective effect of pretreatment with thymoquinone against Aflatoxin B1 induced liver toxicity in mice. Daru. 2011;19(4):282-287. Darakhshan S, Bidmeshki Pour A, Hosseinzadeh Colagar A, Sisakhtnezhad S. Thymoquinone and its therapeutic potentials. Pharmacol Res. 2015;95-96:138-158. Elsherbiny NM, Maysarah NM, El-Sherbiny M, Al-Gayyar MM. Renal protective effects of thymoquinone against sodium nitrite-induced chronic toxicity in rats: Impact on inflammation and apoptosis. Life Sci. 2017;180:1-8. Mostafalou S, Eghbal MA, Nili-Ahmadabadi A, Baeeri M, Abdollahi M. Biochemical evidence on the potential role of organophosphates in hepatic glucose metabolism toward insulin resistance through inflammatory signaling and free radical pathways. Toxicol Ind Health. 2012;28(9):840-851. Nili-Ahmadabadi A, Pourkhalili N, Fouladdel S, Pakzad M, Mostafalou S, Hassani S, et al. On the biochemical and molecular mechanisms by which malathion induces dysfunction in pancreatic islets in vivo and in vitro. Pestic Biochem Physiol. 2013;106(1-2):51-60. Pakzad M, Fouladdel S, Nili-Ahmadabadi A, Pourkhalili N, Baeeri M, Azizi E, et al. 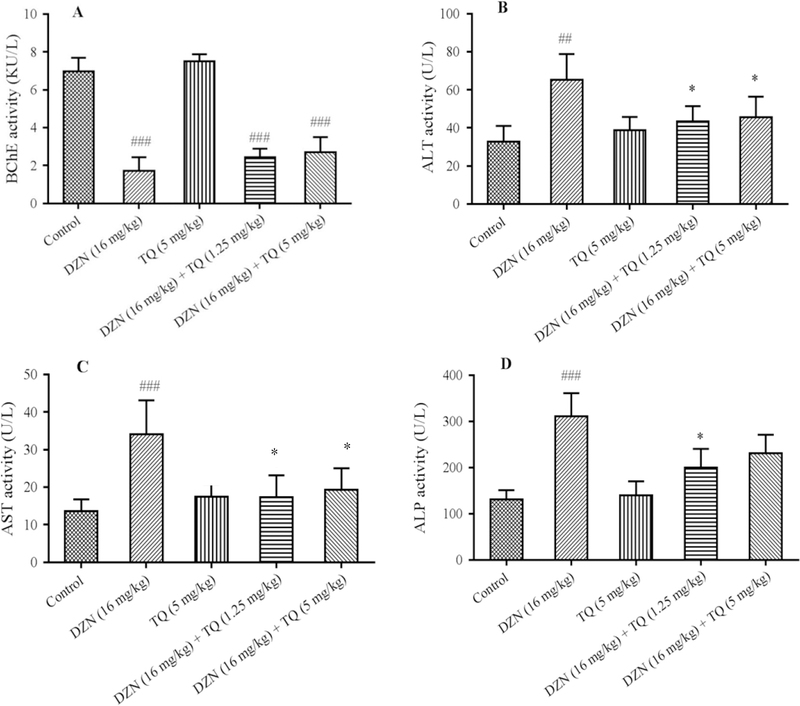 Sublethal exposures of diazinon alters glucose homostasis in Wistar rats: Biochemical and molecular evidences of oxidative stress in adipose tissues. Pestic Biochem Physiol. 2013;105(1):57-61. Lari P, Abnous K, Imenshahidi M, Rashedinia M, Razavi M, Hosseinzadeh H. Evaluation of diazinon-induced hepatotoxicity and protective effects of crocin. Toxicol Ind Health. 2015;31(4):367-376. Kalender S, Uzun FG, Durak D, Demir F, Kalender Y. Malathion-induced hepatotoxicity in rats: the effects of vitamins C and E. Food Chem Toxicol. 2010;48(2):633-638. Rahimifard M, Navaei-Nigjeh M, Mahroui N, Mirzaei S, Siahpoosh Z, Nili-Ahmadabadi A, et al. Improvement in the function of isolated rat pancreatic islets through reduction of oxidative stress using traditional Iranian medicine. Cell J. 2014;16(2):147-163. El-Shenawy NS, El-Salmy F, Al-Eisa RA, El-Ahmary B. Amelioratory effect of vitamin E on organophosphorus insecticide diazinon-induced oxidative stress in mice liver. Pestic Biochem Physiol. 2010;96(2):101-107. Sams C, Cocker J, Lennard MS. Biotransformation of chlorpyrifos and diazinon by human liver microsomes and recombinant human cytochrome P450s (CYP). Xenobiotica. 2004;34(10):861-873. Harchegani AL, Hemmati AA, Nili-Ahmadabadi A, Darabi B, Shabib S. Cromolyn sodium attenuates paraquat-induced lung injury by modulation of proinflammatory cytokines. Drug Res (Stuttg). 2017;67(5):283-288. Ozarowski M, Mikolajczak PL, Piasecka A, Kujawski R, Bartkowiak-Wieczorek J, Bogacz A, et al. Effect of Salvia miltiorrhiza root extract on brain acetylcholinesterase and butyrylcholinesterase activities, their mRNA levels and memory evaluation in rats. Physiol Behav. 2017;173:223-230. Nili-Ahmadabadi A, Ali-Heidar F, Ranjbar A, Mousavi L, Ahmadimoghaddam D, Larki-Harchegani A, Ghafouri-Khosrowshahi A. Protective effect of amlodipine on diazinon-induced changes on oxidative/antioxidant balance in rat hippocampus. Res Pharm Sci. 2018;13(4):368-376. Navaei-Nigjeh M, Rahimifard M, Pourkhalili N, Nili-Ahmadabadi A, Pakzad M, Baeeri M, et al. Multi-organ protective effects of cerium oxide nanoparticle/selenium in diabetic rats: evidence for more efficiency of nanocerium in comparison to metal form of cerium. Asian J Anim Vet Adv. 2012;7(7):605-612. Pourkhalili N, Hosseini A, Nili-Ahmadabadi A, Hassani S, Pakzad M, Baeeri M, et al. Biochemical and cellular evidence of the benefit of a combination of cerium oxide nanoparticles and selenium to diabetic rats. World J Diabetes. 2011;2(11):204-210. Hosseinzadeh M, Omidifar N, Dehghanian AR, Kumar PV, Meshkibaf MH. Histopathological changes in rabbit gastric mucosa after chronic exposure to pickled vegetables: an experimental study. Nutr Cancer. 2013;65(7):1042-1044. Goorden SM, Buffart TE, Bakker A, Buijs MM. Liver disorders in adults: ALT and AST. Ned Tijdschr Geneeskd. 2013;157(43):A6443. Al-Malki AL, Sayed AA. Thymoquinone attenuates cisplatin-induced hepatotoxicity via nuclear factor kappa-β. BMC Complement Altern Med. 2014;14(1):282-289. Bhakuni GS, Bedi O, Bariwal J, Kumar P. Hepatoprotective activity of morin and its semi-synthetic derivatives against alcohol induced hepatotoxicity in rats. Indian J Physiol Pharmacol. 2017;61(2):175-190. Sanmugapriya E, Venkataraman S. Studies on hepatoprotective and antioxidant actions of Strychnos potatorum Linn. 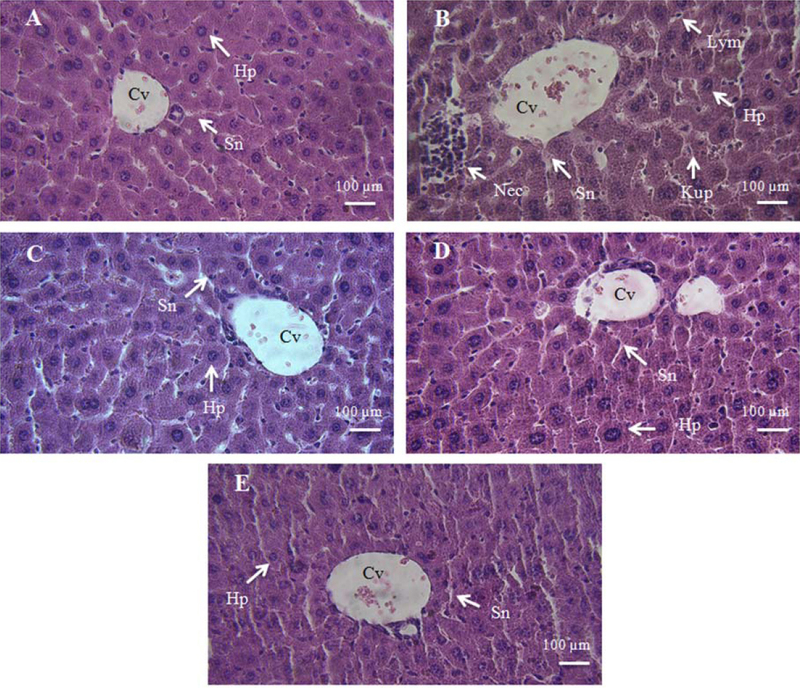 seeds on CCl4-induced acute hepatic injury in experimental rats. J Ethnopharmacol. 2006;105(1-2):154-160. Gokcimen A, Gulle K, Demirin H, Bayram D, Kocak A, Altuntas I. Effects of diazinon at different doses on rat liver and pancreas tissues. Pest Biochem Physiol. 2007;87(2):103-108. Uzun FG, Kalender Y. Chlorpyrifos induced hepatotoxic and hematologic changes in rats: the role of quercetin and catechin. Food Chem Toxicol. 2013;55:549-556. Moore PD, Yedjou CG, Tchounwou PB. Malathion-induced oxidative stress, cytotoxicity, and genotoxicity in human liver carcinoma (HepG2) cells. Environ Toxicol. 2010;25(3):221-226. Karami-Mohajeri S, Abdollahi M. Mitochondrial dysfunction and organophosphorus compounds. Toxicol Appl Pharmacol. 2013;270(1):39-44. Mossa ATH, Heikal TM, Mohafrash SMM. Lipid peroxidation and oxidative stress in rat erythrocytes induced by aspirin and diazinon: the protective role of selenium. Asian Pac J Trop Biomed. 2014;4(Supplement 2):S603-S609. Messarah M, Amamra W, Boumendjel A, Barkat L, Bouasla I, Abdennour C, et al. Ameliorating effects of curcumin and vitamin E on diazinon-induced oxidative damage in rat liver and erythrocytes. Toxicol Ind Health. 2013;29(1):77-88. Chi D, Rong L, Wang S, Wang X, Wang X, Ma L, et al. Role of oxidative/nitrative stress in hepatic encephalopathy induced by thioacetamide. Pharmazie. 2011;66(5):378-381. Aycan İÖ, Tüfek A, Tokgöz O, Evliyaoğlu O, Fırat U, Kavak GÖ, et al. Thymoquinone treatment against acetaminophen-induced hepatotoxicity in rats. Int J Surg. 2014;12(3):213-218. Jaswal A, Sinha N, Bhadauria M, Shrivastava S, Shukla S. Therapeutic potential of thymoquinone against anti-tuberculosis drugs induced liver damage. Environ Toxicol Pharmacol. 2013;36(3):779-786. Mansour MA. Protective effects of thymoquinone and desferrioxamine against hepatotoxicity of carbon tetrachloride in mice. Life Sci. 2000;66(26):2583-2591. Nagi MN, Almakki HA. Thymoquinone supplementation induces quinone reductase and glutathione transferase in mice liver: possible role in protection against chemical carcinogenesis and toxicity. Phytother Res. 2009;23(9):1295-1298. Al-Ali A, Alkhawajah AA, Randhawa MA, Shaikh NA. 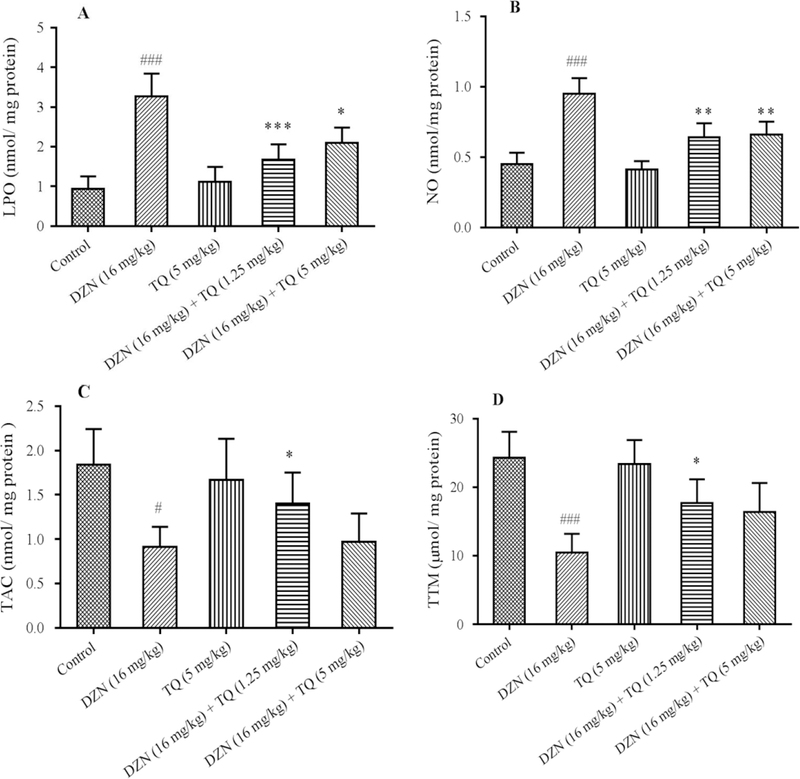 Oral and intraperitoneal LD50 of thymoquinone, an active principle of Nigella sativa, thymoquinone, an active principle of Nigella sativa in mice and rats. J Ayub Med Coll Abbottabad. 2008;20(2):25-27. Marren K. Dimethyl sulfoxide: an effective penetration enhancer for topical administration of NSAIDs. Phys Sportsmed. 2011;39(3):75-82.